Cabinets are the core of kitchens and bathroom, essential to both the form and function of these rooms. They provide critical storage and are the major contributors to style and beauty. They’re also among the most expensive and permanent fixtures and, because of this, perform their duties for many years. 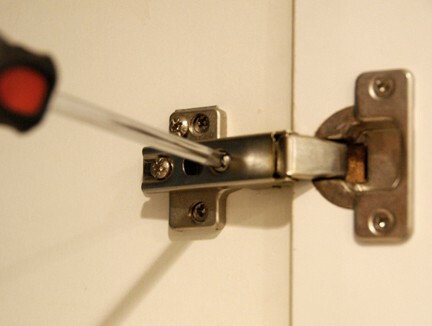 Hinges sometimes need minor adjustment to get doors properly aligned and operating smoothly. Wear and tear is only natural. Doors sag, drawers stick, surfaces get dinged, and finishes wear. 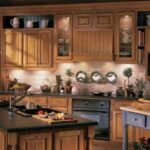 This article will show you how to deal with these problems and keep your cabinets operating smoothly and looking beautiful. Small chips and nicks in wood cabinets can be filled with plastic wood filler, sold in colors to match most wood stains. If the damage is to an area that’s prominently visible, it may be difficult to do a “seamless” repair. Test blending and color matching in an unseen area before attempting a repair where visible. When touching-up a chipped or scraped cabinet, the trick is to match the color. If you use the manufacturer’s original paint or stain colors, which you may be able to discover from a local distributor or cabinet retailer, be aware that the finish may have faded over time. 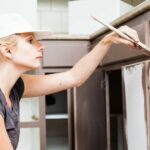 You may have to paint an entire surface, starting and ending at a cabinet edge, because spot touch-ups are more obvious on discolored cabinets, such as near cooking areas affected by heat and airborne grease and soot. 1Use a fine-toothed saw to cut away the damaged area, making smooth, straight cuts. Then cut a slightly oversized replacement piece of the same material and fasten it with glue and, if necessary, small finishing nails or countersunk screws. Sand the repair with fine sandpaper and then stain or paint to match the original. 2If you’re dealing with a deep gouge, clean away the damaged wood then fill the area with an epoxy wood repair kit. Allow to dry, then sand and stain or paint to match. This material works amazingly well, and the repair is often as strong as the wood. Epoxy filler is waterproof so it can be used where the original wood damage was caused by wet conditions. 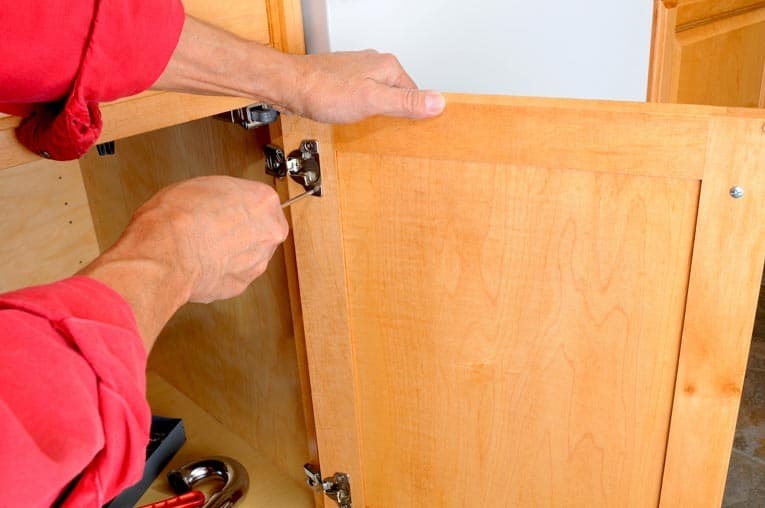 Simple hinge adjustments are easy to make, and many cabinets have hinges that allow you to make micro-adjustments in any direction. For plain hinges, loosen the mounting screws just enough so that the hinges can move but not so much that the door droops. Prop up the door so that it is square with the cabinet opening, using shims if necessary, and then re-tighten the screws. With a European-style hinges, adjustments are easy with the turn of a screw. Most European-style hinges have built-in adjustment set-ups, and there are several types. One has a single screw connecting the two halves of the hinge. Loosen this screw slightly and you can reposition the door vertically or horizontally, then re-tighten. Another type of hinge has a sliding bar with a set-screw for horizontal adjustments and a separate set-screw for vertical adjustments. The newest hinges have snap-on mounting plates that allow you to adjust both height and depth. 1Tighten the hinge mounting screws. If this only helps for a while, or the holes are so worn that the screws no longer hold, remove the screws one at a time, squirt a little white glue into each hole, and then insert toothpicks into the holes. Wipe off any excess glue, and, after the glue dries, cut the toothpicks flush with the surface using a utility knife. Then drive new screws into the refurbished holes (you may have to drill small pilot holes first). 2Replace the hinge screws with longer or larger screws. This usually requires drilling deeper pilot holes, which may not be possible with some cabinets, or using larger diameter screws, which may not fit the hinges as well as the originals. For these reasons, give this option careful consideration. 3Move the hinges. If the screw holes or mounting locations are badly worn, try shifting each hinge to a new spot where the wood is stronger. This works best if the hardware is hidden because otherwise the old locations will be visible, especially where the hinge leaves mount to the face of the doors. If you do decide to go with this option, you might also want to consider self-closing hinges, which eliminate the need for catches. To lift old shelf paper, you’ll want to warm and dissolve the adhesive backing. To start, peel up a corner. Continue to lift as you spray warm water on the backing. Stubborn residue can usually be removed with vegetable oil. If you are removing the paper in preparation for painting, wash the shelf with sudsy water, rinse, and let dry completely. Cabinet drawers can have a variety of problems that make them difficult or even impossible to use. They can become stuck, their glides can become damaged, or the boxes themselves can break. Overloaded drawers are often the cause, so be sure to avoid stuffing them too full of heavy items or piling the contents too high. Also check that the runners haven’t worked loose or been forced out of alignment. A drawer or sliding shelf that’s off its track can be difficult to remove without damaging it even more. Try working the thin blade of a putty knife between the drawer and the runner and then gently tap the drawer back in line. If you’re successful, the drawer slide will pop into place and you can remove the drawer and correct the problem that made it slip its track in the first place. Broken or damaged drawer glides have a way of reminding you over and over that they need to be repaired. In some cases, the problem is merely that one or more of the mounting screws on the glides has fallen out. You can repair this by simply replacing the screw or screws. 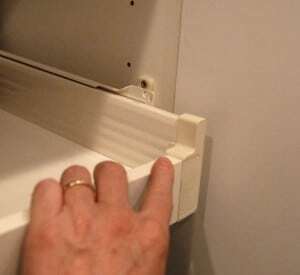 When drawers or sliding shelves are balky, adjust or replace the glides. More commonly, the glides have become bent or broken. In this case, the easiest remedy is to replace them. For the smoothest, most trouble-free drawer opening and closing, purchase prefabricated metal ball-bearing glide sets that attach to the drawer bottom or sides, depending on your drawer’s construction and current type of glide. 1Remove the drawer by pulling it out and then lifting the front to disengage the drawer from its track. 2Check the glides on the drawer and inside the cabinet. If they’re just bent or misaligned, reshape them with a pair of pliers and slide the drawers back in. 3If something is broken, unscrew the glides both from the drawer and from the cabinet. 4Buy replacements at a hardware store or home improvement center. Be sure to take along the complete glide set (both halves) as a sample of what you’ll need. 5Screw the new glides to the cabinet and drawer and slide the drawer back in. Drawers are sturdy but simple in construction. When they break, more often than not it’s caused by either a split in the wood or a glue joint that has come apart. Fix splits by realigning and gluing together the broken pieces (use wood glue), and clamp them together for at least an hour. Do the same with separated joints, but first carefully clean away as much of the old glue as possible, taking care not to damage the joint or the wood itself.